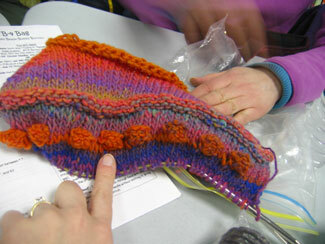 Cheri's making another felted bag and this one has giant bobbles. Look! 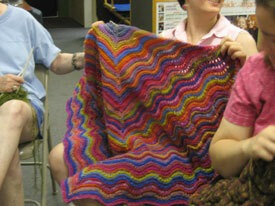 Cheri has just finished this incredible shawl, made mostly with Noro Kureyon. 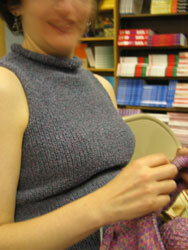 She plans to donate it to charity. What an amazing gift it will be! 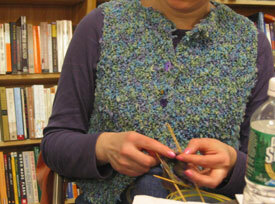 We may have all pulled out our wool sweaters again due to the cold weather here in Boston, but Cheri was keeping the faith wearing her springy, fun vest made of Plymouth Siam yarn. 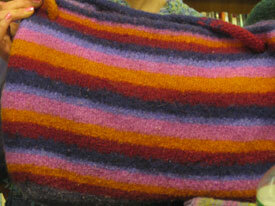 And here's her even funner big Booga bag! 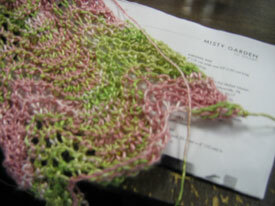 Cheri's beautiful Misty scarf (from Scarf Style) in progress. 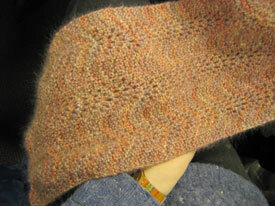 Cheri's making a gorgeous scarf out of Brooks Farm's wonderful mohair yarn.